Here's the scenario: a professor I worked with was panic-stricken. She had a contract with a prestigious university press that fizzled after her editor left. The contract had all sorts of loopholes in it, including that pesky "time is of the essence" phrase that I advise authors to strike. Anyway, she was now contractless before tenure. 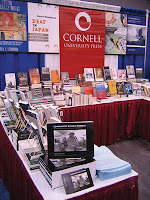 Fortunately, BookExpo America was going to be in Washington, DC for the first time in 17 years, so I suggested to her that we put together an amazing promotional package for her book and go trolling the University Press Pavilion for a new deal. Before you roll your eyes, I know that everybody in the book world knows that selling your manuscript is not actually what BookExpo is for. It is primarily a showplace for publishers' wares. Reps and bookstore buyers go there to see what's new, hot, different, or (more typically) just the same as last year and the year before. But over the years writers started glomming on, so much so that BookExpo started its own pre-Expo writers conference just to give them something to do besides bother the publicists. I also figured enough actual editors would be hanging around the booths that if we were lucky we would charm the dickens out of 'em. We also e-mailed all of our target presses and editors ahead of time to get that all-important "Sure, I'd be happy to say hello" response that makes pre-conference planning so powerful. The professor landed an amazing publisher (it was one of these -- Stanford, Duke, Penn, MIT, Cambridge -- but I won't say which for fear of creating a stampede) from one of the editors who had previously responded to our pre-conference e-mail with a friendly note. Pre-conference planning is the best. So is a warm and engaging attitude, humor, and the big-picture understanding that while getting a book deal is certainly important, it is not exactly high up there on the list of international human rights priorities... so we relaxed about it.